Ace Monster Toys had its first booth at a Maker Faire last weekend. Technically, we were at the East Bay Mini Maker Faire this last Fall but that was a purely local event. For those not familiar with it, Maker Faire is an annual event in the Bay Area sponsored by O’Reilly Media and associated with Make Magazine. More than 10,000 people come to see various projects, vendors, and exhibitions of maker and hacking culture. Think of it as a souped of science fair for people who make things and the community around it combined with a little bit of a trade show for vendors associated with it. Personally, I could do with a few less professional vendors and more projects but it works out pretty well. Willow from Jigsaw Renaissance in Seattle organized a room for hackerspaces this year. In previous years, hackerspaces who had booths were spread over the main expo building so this got everyone together in one area together. This turned out to work fairly well and we got to interact with other spaces, both local and from much further afield. I met the founder of the Tokyo Hackerspace, as well as Arizona’s Heatsync Labs and Crash Space of Los Angeles. AMT was demonstrating the prototype of our DIY Book Scanner. We had just made beta kits of the laser cut portions of it, along with commodity parts from Home Depot or the like. We got asked an awful lot, “How does it turn pages?”, and had to demonstrate that you turned the pages yourself after pivoting the glass top, which was quicker (and tens of thousands of dollars cheaper) than building a page turning scanner. We even sold a few kits. We probably handed out one or two thousand flyers, met some local teachers and other educational folks, and got the word out that there is a hackerspace in the East Bay. 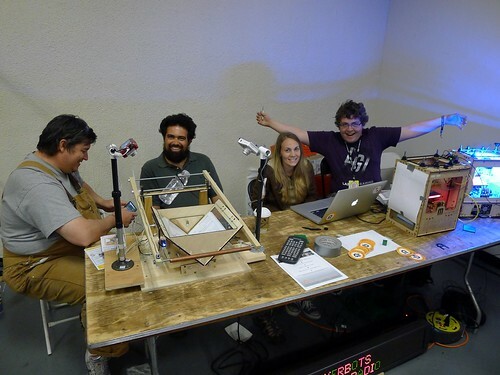 At this last Thursday’s post-Maker Faire weekly meeting, we had three new people show up and at least two of them admitted to seeing us at the Maker Faire, so I think that it has worked out well. Getting the word out about us into the local East Bay community, especially amongst all of the makers in the Burning Man crowd, is one of our next big projects.